moment because Banks is growing and changing everyday, its insane! 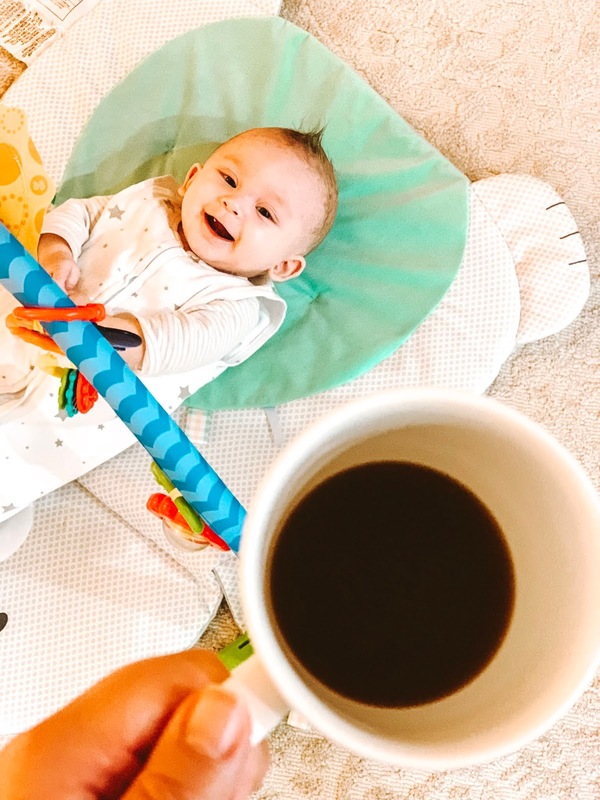 Many of you have asked how I handle my biz with a baby and I'll say its been a learning experience for sure however I thought it might be fun to give you a glimpse into our new morning routine as we are out of the "no sleep" newborn phase and have settled into a pretty good sleep schedule with him. Banks usually wakes up around 7:00 am - 7:30 am and I'll admit a few months ago I was getting up the second I heard him over the monitor. I would try to rush around to get myself semi-together before I went to get him and after a few weeks of that I realized if I was rushing in the morning, my whole day would feel chaotic. I just felt behind and a mess all day plus to truly believe its important to take even 10 minutes for yourself to feel ready to tackle the day! Lately, Todd and I have really focused on working out in the morning even if its for 10 minutes which means we need to wake up before Banks to really have some undivided time to break a sweat! 6:45 am // Alarm goes off! We try, try, try to wake up and not hit snooze but ugh, it just seems so early! We get up and pop on some workout clothes and start a YouTube workout with Fitness Blender in our bedroom. I personally do not like going to the gym alone so it's been fun to hold each other accountable and do a 30 minute workout in our bedroom. I highly recommend Fitness Blender, you don't need any equipment and they have levels for any stage you are at. Clearly, I started with beginner post baby! 7:15 am // Brush your teeth and lets go! We are typically done with our workout and Todd hops in the shower for the day but I get myself ready quickly and go get Banks. I use some witch hazel to clean my skin after the workout and brush my teeth. 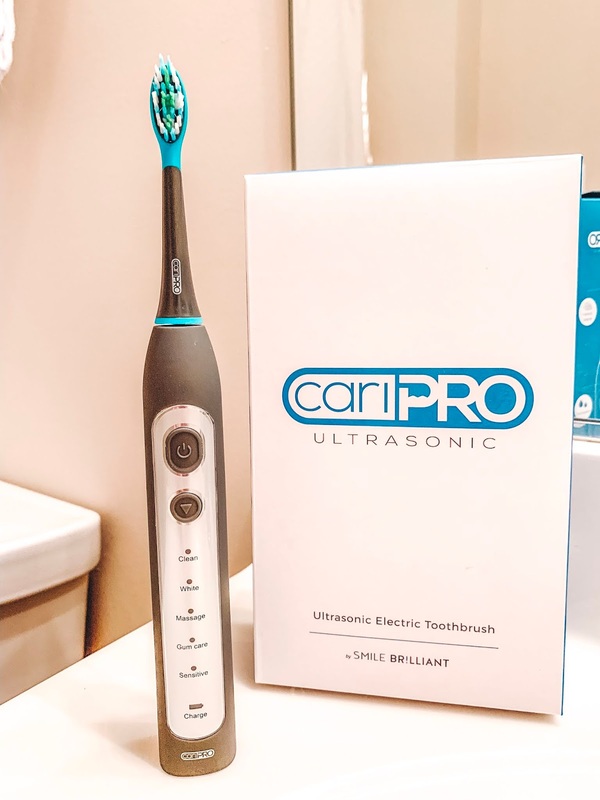 By now, you have heard my rave about my new Smile Brilliant cariPRO Ultrasonic electric toothbrush all over instastories! I've been known to just to go the store and pickup a battery operated tooth brush and call it a day. To be honest, I am slightly terrified of the dentist so I've always wanted to invest in a good toothbrush but omg typically they are so expensive! 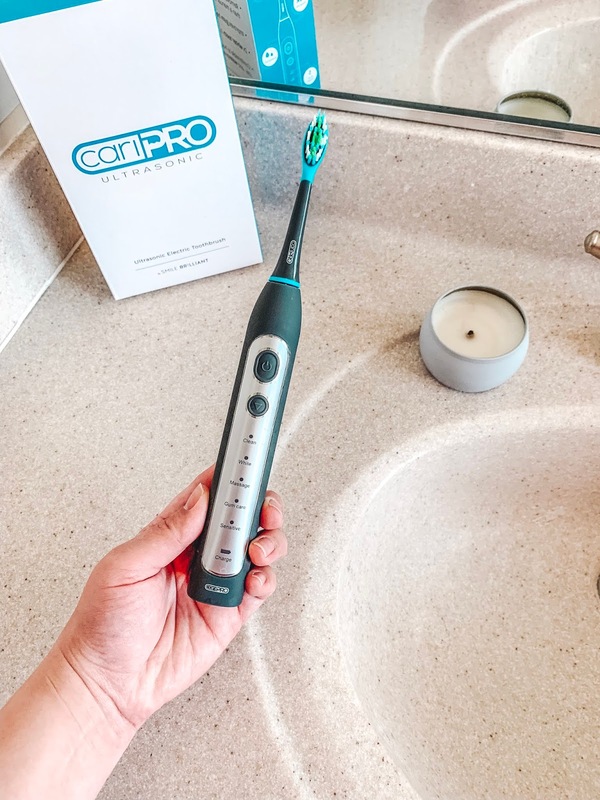 Y'all know I am a coffee drinker and diet coke addict so I need something that will help protect and clean my teeth and let me tell you guys, I have a seen a major change in my teeth but mainly in my gums since using the cariPRO! And BONUS, it is WAY MORE AFFORDABLE and comes with a 2 year manufacturer's warranty! This toothbrush has 5 brush modes and as someone who always uses a soft toothbrush this was extremely appealing to me. The modes are clean, white, massage, gum care and sensitive and I use all of them on any given day! For those of you out there with sensitive teeth and gums, the clean setting you might be nervous about but it is so gentle yet effective! I have sensitive gums and I use this setting everyday! The brush helps guide you to ensure you are getting your full 2 minutes by pulsing to let you know its time to move to a different section. Plus the battery on this baby is incredible! I charged it up the night before we left for OBX and it lasted our whole trip without being charged. As someone who travels frequently, that is always important to me in a toothbrush. I can't get down with a manual toothbrush so the fact that this is electric and can hold a charge for 30 days is a game changer for me. With all the coffee I drink, I am obsessed with the white mode too. I typically start with the clean mode and end with the white mode. This is no joke, you can truly see a difference in just one day after using the white mode. Even Todd noticed a difference and he never notices things like that! He was so convinced he started using the extra brush that came with the kit. 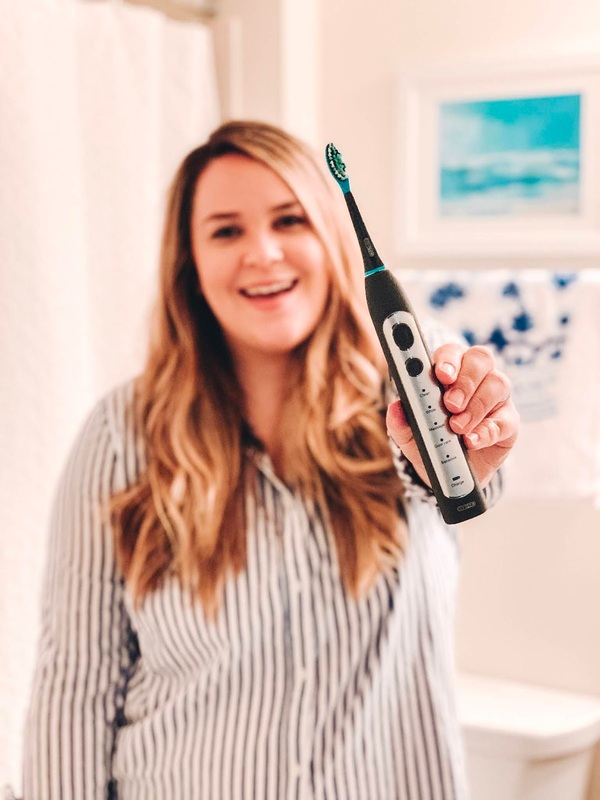 This brush states that it improves gum health in just 2 weeks and I can confirm that is so true! 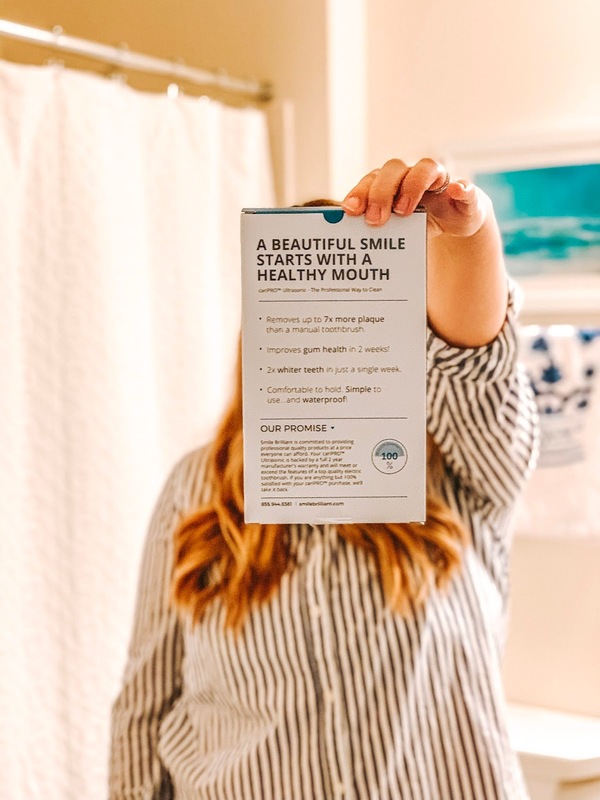 My gums are very sensitive and I've noticed that they are much stronger than before and even feel better...it's hard to explain but I notice an overall improvement and my gums are definitely an area I am sensitive about. Can you tell how obsessed I am with this product?? 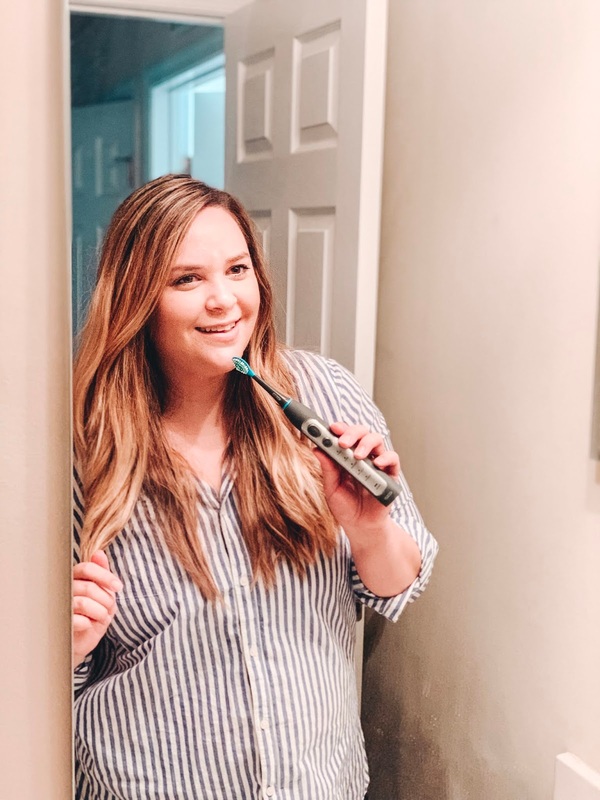 Well good news for you, I am SO EXCITED to announce I have partnered up with Smile Brilliant to giveaway one electric toothbrush to you guys!! I just know you will absolutely love this product as much as I do! If you need more info, I would encourage you to check out the FAQs! I absolutely know you will love it as much as I do and when you register for the giveaway or decide to purchase using the 20% off discount, make sure to let me know via instastories by tagging me and tagging Smile Brilliant at @smilebrilliant and using the hashtag #smilefearlessly!! We can't wait to see your posts! I get Banks out of his room and head downstairs to feed him, I drink all the coffee and we play until he goes down for his first nap. While B naps, I take a shower and get dressed and usually do my 10 minute cleanup in our bedroom and do laundry. OMG, the amount of laundry you have with a baby is wild! Moms, you know what I'm talking about! Hop over to my instastories as I normally share a lot of our routine with B and I can't wait to see who wins the giveaway!! *This post is a collaboration with Smile Brilliant. All opinions are my own. © Brittany Collier // Life with Brittany .